Blowtorch yes yes yes no yes no yes no Free! Andromud no yes yes ? yes no yes yes Free! Feature-rich and flexible client with triggers (regular expressions available), multi-command aliases, ticker/timer, button-based macros, persistant connections, export/important settings, and is hyperlink-aware. The features in this client rival some desktop clients. » Pros: Light on resources with data (MCCP) Compression available. Creative use of features like buttons doing one thing when tapped and another when swiped. 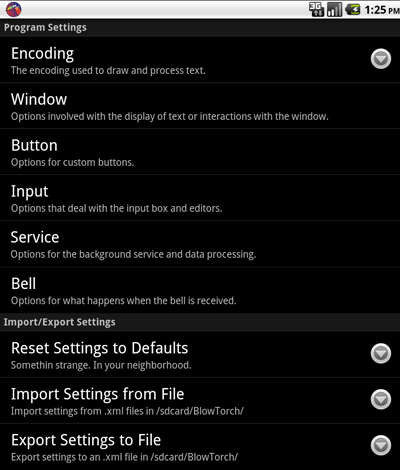 Multiple button profiles. Great help system on the website. Under active development. » Cons: No variables -- yet. No Gags. Can get inturrupted by call or SMS. 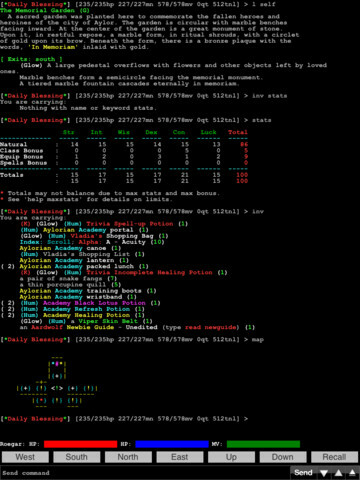 Chained commands (n;n), meta commands (#3 eat) with wait command, client aliases, triggers, timer, shortcuts (5 of them). » Pros: Many commonly-used features. » Cons: No portrait mode. iMud yes yes yes no no no no no Free! TMC Game Client yes no no no no no no no Free! 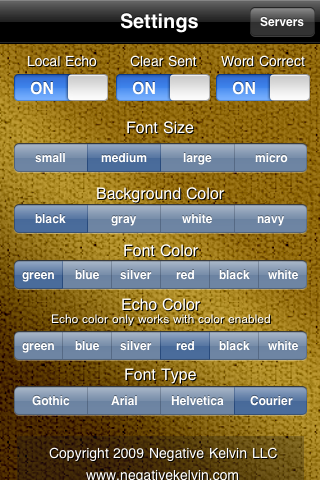 This is a good app for the iPhone -- It is full-featured for a mobile client including macro buttons, triggers, ticker/delay, keyboard transparancy/hiding, external keyboard support, directional arrows, command repeating, multi-touch gestures (think swipe diagonally to move northwest) and some basic scripting among other features. It has a decent in-client help system. It also handles persistant connections. » Pros: Good performance. Under active development with responsive developer. Surprisingly advanced client with LUA support for triggers, gags, aliases, command history, ticker/timer, persistant connection, in-client help system, sounds and gauges. LUA is a scripting language and is nice because it allows for variables and full-featured logic for triggers. The features in this client rival some desktop clients. Basic client with simple triggers, nicknames, multi-command aliases and a button feature. » Pros: Looks good. Simple to use. » Cons: Crashed a lot. No persistant connections. Simple client with triggers, 'word lists' (aliases) and buttons. This is a basic client where the main feature is the list of muds. Directional buttons available. » Cons: Not many features, slow. Has aliases, triggers, variables, speedwalks, buttons, macros, and is stable. 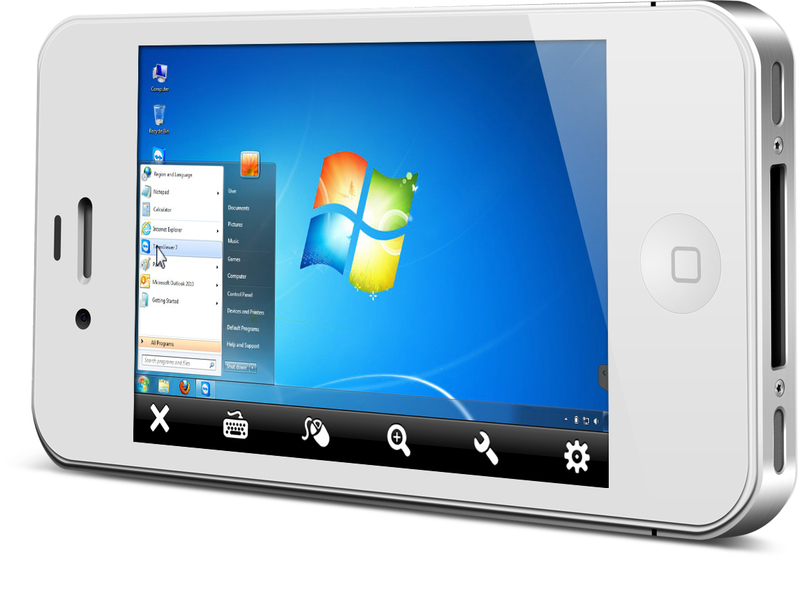 You leave your computer on and use an app like TeamViewer (Free for personal use on major smartphone platforms) to connect from phone to home computer. This works well and allows one to use whatever client they want from their smartphone or tablet. Teamviewer also will bypass most firewalls at work if they block telnet or gaming sites. Using Telnet/SSH: While the following clients can telnet to the mud directly the real beauty of them is that you can ssh/telnet to a home server running your full-blown command-line client (like TinyFugue or TinTin). You can even keep your session persistant between your phone and computers with the common 'screen' command on UNIX-based systems. This is an implementation of PuTTy, the popular open-source SSH client. While at first glance pTerm seems like a very simple SSH/Telnet client, it is refined well and extended use has prooven it to be very stable and light on resources. It can run for hours, all day without a hitch. » Pros: Stable. Adjustable font size. Great performance with default scrollback settings. » Cons: Short scrollback, development is not active, no multitasking/persistant connection. 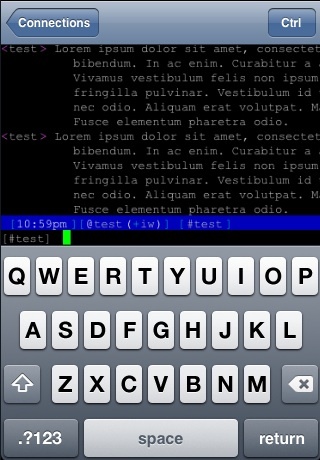 This SSH app tries to do everything much better than pTerm with the addition of a nicer keyboard/input system and persistant connections however it doesn't handle 80 columns well, and can really clog up the phone. I've seen it crash many times. » Pros: Full featured, attractive App. Beeps. Free version of Mocha Telnet which seems like a promising telnet app. The full version adds function keys, Esc, Tab and Arrows. The Lite version is bare-bones, but well done. » Cons: Not many features. While being the most expensive offering, depending on your phone this may also be the best offering as well. It does both SSH and VNC/RDP, so you can view/share the screen of a computer and run a client like CMUD or Portal from home. The text handling is very nice, and while it seemed launching X11 and connecting via VNC/RDP was a bit buggy the SSH functionality is very nice with great text, great handling of persistant connections and multiple connection support. » Pros: Very polished. Beeps. This seems like a solid SSH/Telnet client for the Android platform with a nice featureset. You can have multiple sessions at once and create secure tunnels for other apps (like your web browser). » Pros: Open Source, polished. » Cons: No keyboard support.